Here are a few years of playlists for a radio program that no longer exists called DIG UP THE ROOTS. Dig Up The Roots was a radio show on KFAI 90.3 FM, from 2004 – 2010 in MPLS, MN. The name references research and discovery. Finding the roots of roots music and the process that leads to something unexpected and wonderful. The show jumped around in the nether, lost and haunted regions of traditional music and recorded audio history – roots music. It showcased a wide variety of musical genres and styles from the earlier years of regional, national and international recorded music, Look around and listen and you will find tangents and threads spinning out in every direction. An on going feature of the program was the On-Air playing of 78 RPM Records. This was done with The Ancient Mix-Master, a DJ system from the late 1930’s. It allowed the sharing with the listening audience a new world of old material. Music that demonstrates how the past doesn’t go away and how the ancient consumes the future. Sounds from around the world and from those wonderfully musty basements. It usually took place around 78 O’clock. Many of the shows are already available to listen to online. I have never ending and never beginning plans to make available most of the recordings I have, In places within the playlists when performers names or the source recording info is missing it usually means that it is the same information, a record or cd name, as the entry above it. But sometimes it means that I don’t know what is going on either. Thanks for tuning in and checking this out. 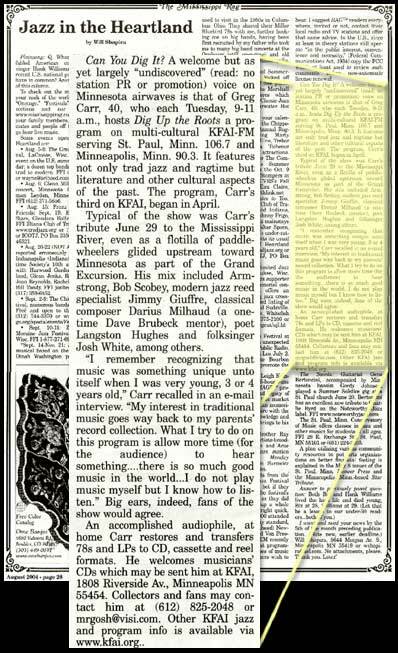 Here is an article about that show from August of 2004, published in The Mississippi Rag.